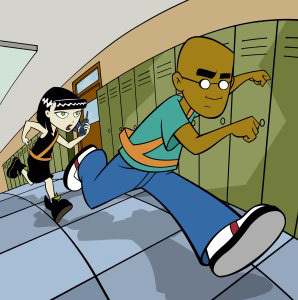 Schoolyard justice has a hip new defender in Safety Patrol Officer Cornelius Fillmore, the title character of the new animated series Disney's Fillmore! Produced by Walt Disney Television Animation, the series captures the essence of the great 1970s cop shows - in the guise of a smart, quick-witted seventh-grader out to stop crime in its school-age tracks. Voiced by Orlando Brown, is in the seventh grade at X Middle School, where he is a member of the Safety Patrol. 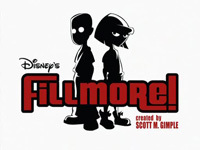 Fillmore was a juvenile delinquent, his crimes included (according to his permanent record) "milk counterfeiting" and "backtalkery". Fillmore's life changed when Safety Patrol member Wayne Liggit gave him a choice: Spend the rest of middle school in detention or help him solve another case. Fillmore was recruited into the Safety Patrol as a result of his helping out. It's revealed he's an only child, has a pet dog, and a pet fish and is really good at mini golf. Voiced by Tara Strong, is Fillmore's second partner in the Safety Patrol. Before she arrives at X Middle school it was revealed she was sent to a reform school in Nepal for an incident involving a stinkbomb and a pi?ata. Third, another former delinquent and a certified genius (She becomes the smartest kid in X middle school) due to her photographic memory, arrives at X Middle School and partners with Fillmore after he helped her clear her name in "Ingrid Third, Public Enemy #1". Her father is a professor and she has an older sister. Her mother is seen but never mentioned. Voiced by Horatio Sanz, is the junior commissioner of the Safety Patrol and Fillmore's immediate superior. Vallejo has had some rough experiences in the Safety Patrol as an officer, such as losing his friend Malika when she joined the Red Robins, and unintentionally betraying his partner and best friend, Frank Bishop, a profiler, after a case went wrong. Vallejo has problems with drinking too much cocoa. Voiced by Lauren Tom, is the crime scene investigator on the Safety Patrol who has a keen interest in forensics. Although she appears in almost every episode, she is more of a background character. Voiced by Danny Tamberelli, partnered with Karen Tehama and known for his bodyguarding training. Although he appears in almost every episode, he (like Tehama) is more of a background character. Voiced by Kyle Sullivan, is the crime scene photographer for the Safety Patrol. He has a tendency to get on other people's nerves and has some weird thoughts and ideas such as trying to photograph his own buttock. O'Farrell serves as the primary source of comic relief on the show. He is also able to develop film with common household items as seen in "Masterstroke of Malevolance." Voiced by Wendie Malick, the principal of X Middle School. In context of the show's police drama parody theme, she represents the over-stressed mayor archetype. Tough on the outside with looks that can stop any student in its tracks, she runs her school with a strong presence - but she does it for pride and honor. She does have a kind heart on the inside and does much for her students and staff, sometimes anonymously. It is stated that she is around 40, as in "Next Stop, Armageddon" Vallejo mentions that "It starts with a 4."